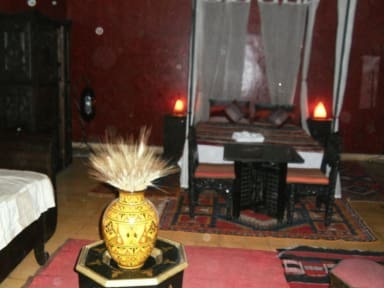 Riad Jomana i Marrakech, Marokko: Reservér nu! Si le client annule après le réglement du solde, 2 semaines avant la date d'arrivée, ce paiement sera conservé. Attention : une Taxe Touristique, reversée intégralement à l'Office National Marocain du Tourisme (ONMPT), de 1,40 euro par personne hébergée et par nuit, sera perçue en complément des tarifs indiqués. 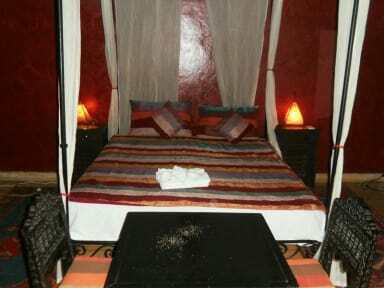 The riad offers you the choice of two rooms and two suites all decorated in a Moorish style (for the twin room, the private bathroom is outside the room, on the same floor). Attention: a Tourist Tax, transferred completely to the Moroccan National Service of Tourism (ONMPT), 1,50 euro per accommodated person and per night will be perceptible as a supplement to the pointed out rates. A dynamic team is on hand to welcome you and help make your stay in the Red City an unforgettable one. While away the hours on the patio, lulled by the gentle splashing of the fountain, or sample some mint teas and Moroccan pastries on the roof terrace overlooking the roofs of Marrakesh against the backdrop of the peaks of the Atlas Mountains snow-capped for part of the year. The attentive yet discreet care taker at the Riad Jomana is as ready to help you during the day as he is to watch out for you when you return from a night out on the town. The Riad Jomana team can suggest a variety of activities, calling on a host of local partners. There are excursions to Essaouira, a small fishing port and seaside resort on the Atlantic coast, the Ourika Valley with its waterfalls and overnight trips to the desert, as well as many sites of interest in and around Marrakesh. We can also arrange car-hire, anything from a little runabout to a 4WD vehicle. The Jomanians, as we call our staff can take care of everything, leaving you free to enjoy your holiday! Riad Jomana proposes : Meals, A variety of drinks, Laundry, Safe, Massages, Transfers to and from the airport, Escorted tours of the city, Transfers to and from the railway station, Henna tattoos.